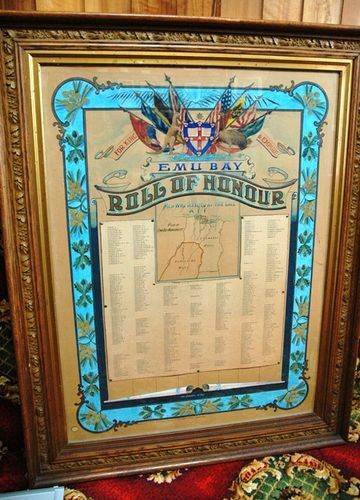 The municipal honour roll was hung on Monday in the public reading-room, having recently been completed, and in all 427 names are on the scroll, including nurses and naval men who enlisted from the municipality. Of this number 71 made the supreme sacrifice. The design is the Australian coat of arms surmounted by flags of the allies, and surrounded by sprays of oak and wattle, the whole being handsomely framed in a massive oak frame. The original design was evolved by Mr F. J. Tallack, and the illumination work was executed at the "Examiner" and 'Weekly Courier" office. The artistic production is a credit to all concerned, and has been viewed by a large number of persons. Examiner (Launceston) 15th September 1920.